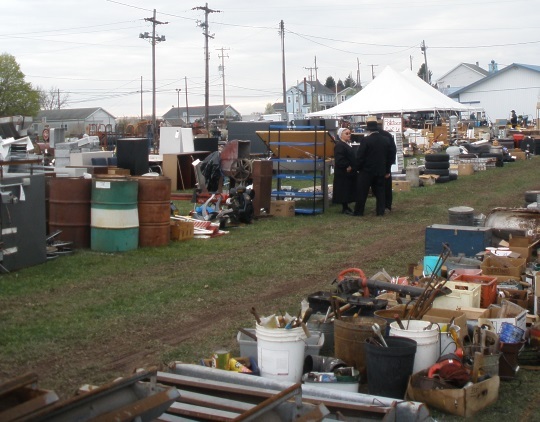 It’s been a while since we’ve checked in on the Amish auction scene. 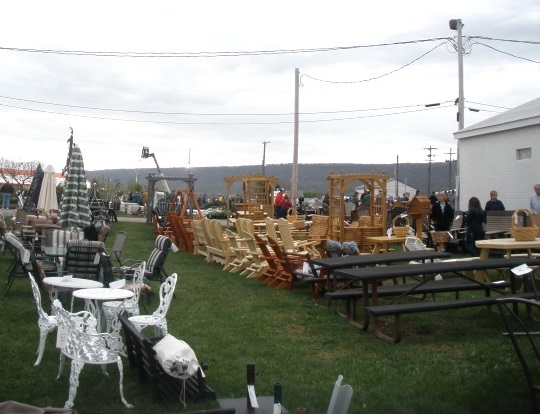 Reader Jerry, a regular sale-goer, shares photos from the Gratz Fire Company Sale. 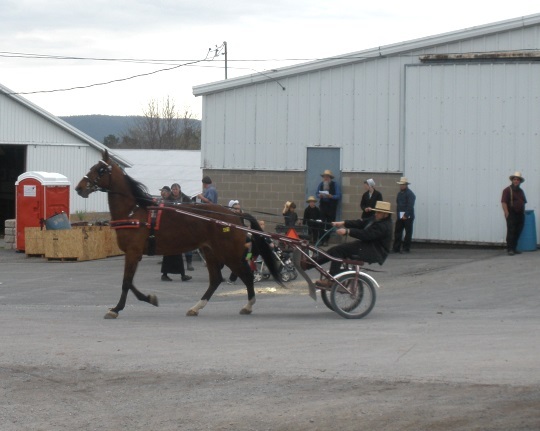 This one took place May 1st and 2nd in Gratz, Pennsylvania. 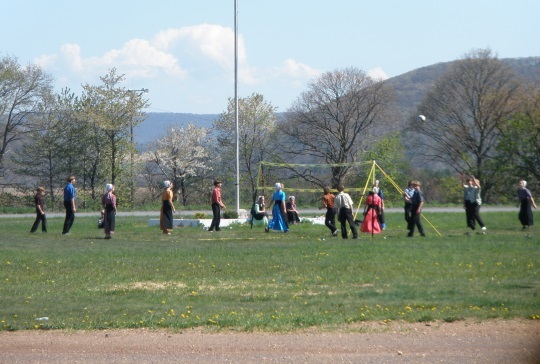 This is not located in Lancaster County, but the Dauphin County community are Lancaster-origin people, as you can see by the buggies and dress in the photos below. 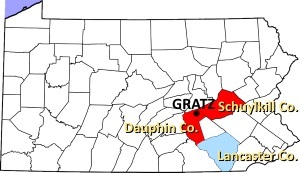 The settlement is technically located in both Dauphin and Schuylkill counties, and also goes by the name “Lykens Valley.” A sizeable community at eight church districts, founded 1978. 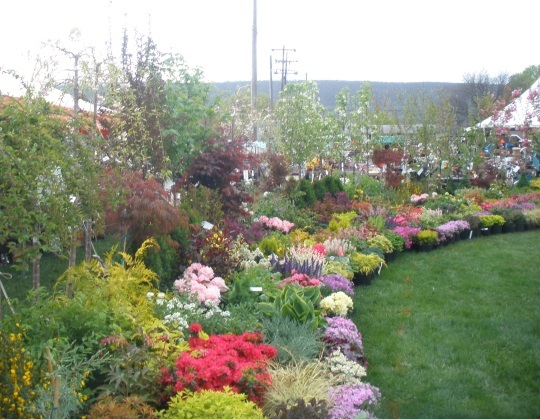 Proceeds from this sale benefited two institutions: Gratz Fire Company, and the Amish Schools of Eastern Lykens Valley. The sale website says that they “will have over 8000 people pass through our gates.” Sounds pretty well-attended. Jerry’s photos and commentary follow below. Rows and rows of stuff. The mud. You can’t have a mud sale without MUD. 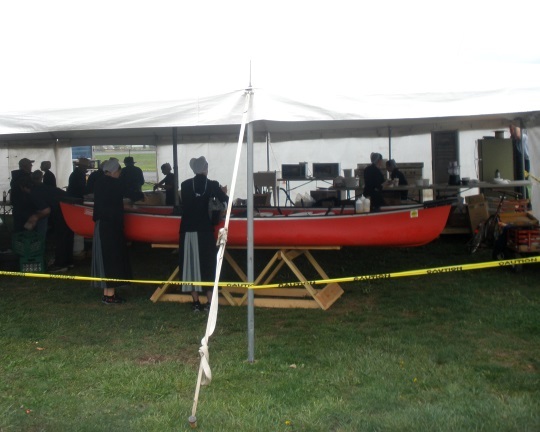 The food tent where a canoe becomes a salad bar. The Amish children love the “Candy Store”. They all walk around with candy treats. These events are very special for the children. It’s like a major outing and many are amazed at everything going on. The people who bring the horses to the auction test drive each one so the people who need a buggy horse can see how each performs. The buyers take notes on which they like. 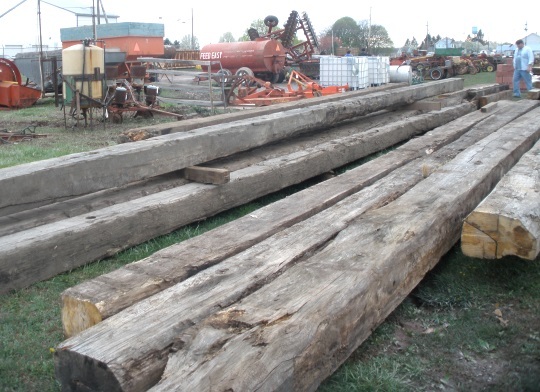 Beautiful lumber. 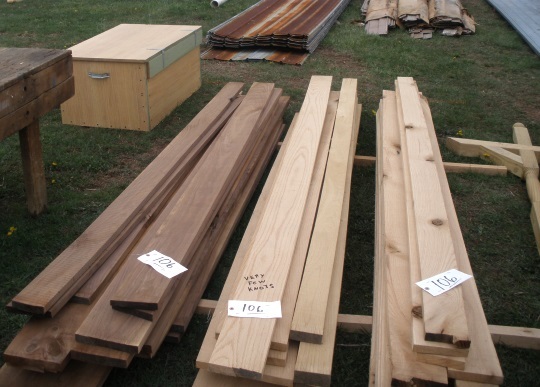 I bought all three stacks for my personal hobby of hand making furniture. I use a lot of hand crafting much like if not more than the Amish themselves do. 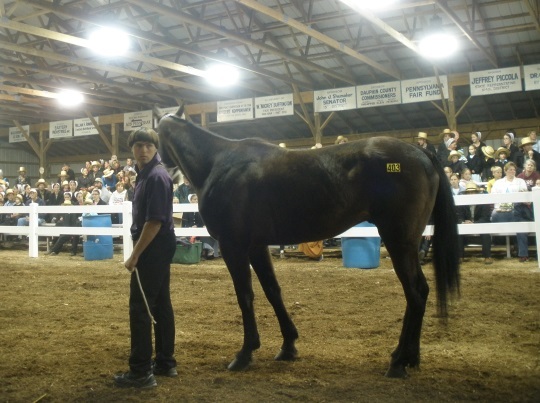 This gelding sold for $6700.00. I thought that was way too much. 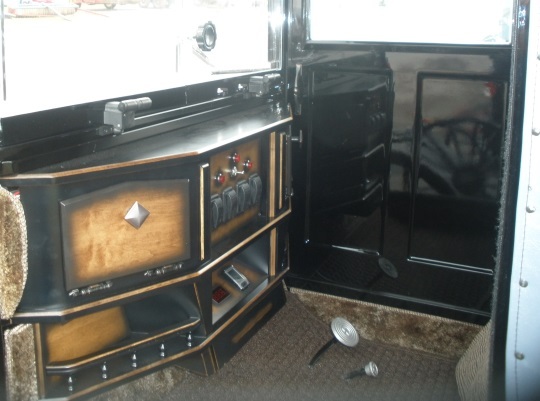 Some others sold for around $3000 and some where not sold because they did not bring what the owners wanted. They said that they would bring much more in Lancaster County. Courting teens always play volleyball. I’ve seen this activity in over half of the mud sales events. 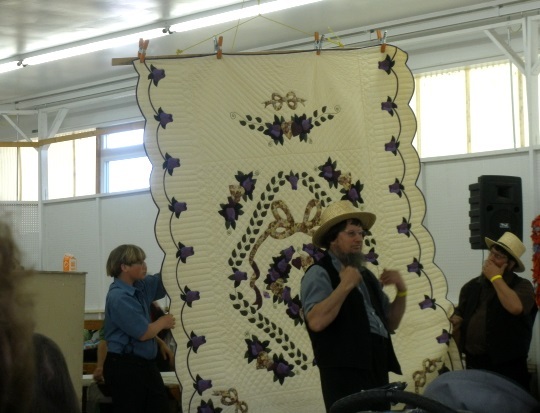 This quilt sold for $275. The horses sold very high and I thought the quilts sold too low. The quilts at this sale were some of the best I’ve seen. Some auctions have ugly quilts but not here. I examined the workmanship and these quilts were excellent. Thanks to Jerry for the photos. 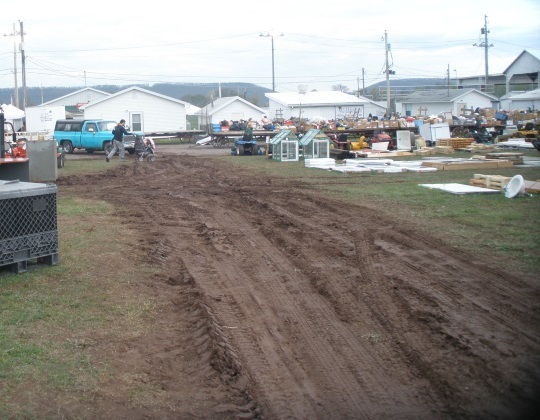 If you’d like to attend a PA auction, you can find a list of Lancaster County mud sales here (there are still five or six events on the calendar, including this Saturday). The Clinic for Special Children also has five auctions planned, beginning in June in Union County (that schedule is here). A lot of work out into that quilt for it to sale for $275. Someone got a very good deal on that quilt. Lovely piece of work. Thanks for sharing all the great pictures. The quilts are so pretty and not a bad price for them. Looks like they had a lot of everything to sell. I love these pictures! Thanks for letting us see them. I’m curious about one picture. The salad bar/canoe picture shows gray on the back of the ladies’ dresses. What is that and is that commonplace in a particular community. I have never seen that before today. The ladies are wearing black aprons like many PA Amish women do. The gray is just the dress but with the apron covering a lot of the dress, you just see that patch of color in back. Just looked at the picture again. They have coats or sweaters on too. If they weren’t wearing those, it would be more clear it’s a black apron. Thanks, Mark. That makes a lot of sense now that I look at the picture again. I’m coming to your neck of the woods in Sept and can hardly wait!! Do you know what you want to do & see? Well, for one thing, I MUST go to Mrs. Yoder’s Kitchen. I’ve heard so much about it that I am anxious to experience it myself. Beyond that, I have no plans. What do you suggest? The last time I was there, I remember thinking that Holmes County is one of the most breath-taking places I’d ever seen. (The rolling hills are high on my list) I want to take in the beauty of the place and am open to your suggestions. I spent last evening trying to find a place to stay. Any ideas on that matter? – The Amish & Mennonite Heritage Center between Mt. Hope & Berlin on CR 77. A 15 minute video on Amish & Mennonite life today, a 30 min. 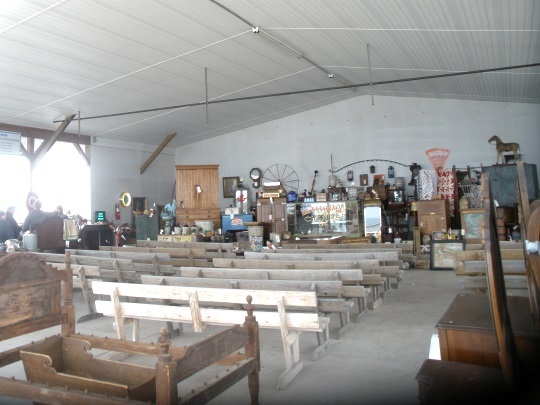 guided tour (there is a fee) that gives a great presentation on Amish & Mennonite history, for an additional fee, the 1850’s one-room school then the pioneer barn. 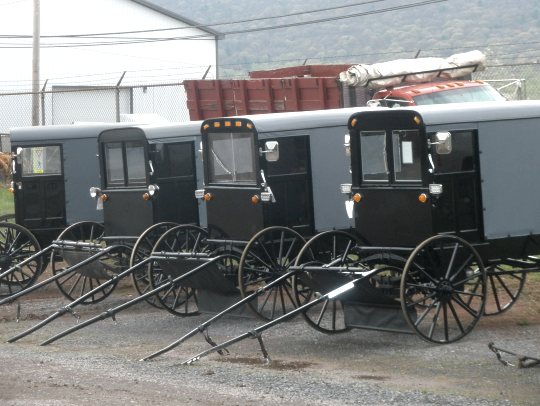 You learn about Amish schools, barn-raisings, covered wagon travel, and see Amish buggies up close. It should be everyone’s first stop in Holmes County. – Yoder’s Amish Home gives tours of two Amish homes (no-longer lived in but were at one time), their barn, buggy rides, and a newly built Amish-style school like what is used today. Their admission is based on which parts of their facility you wish to tour. 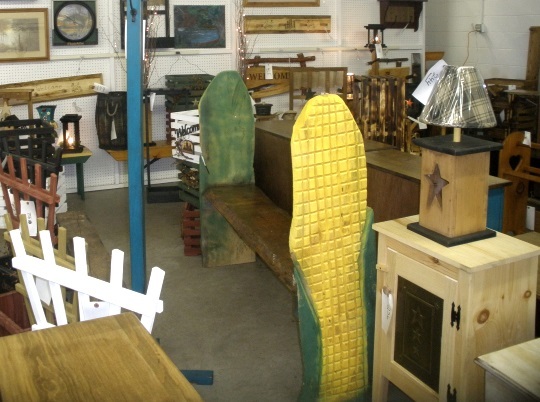 – Lehman’s Hardware in Kidron — another must-see. 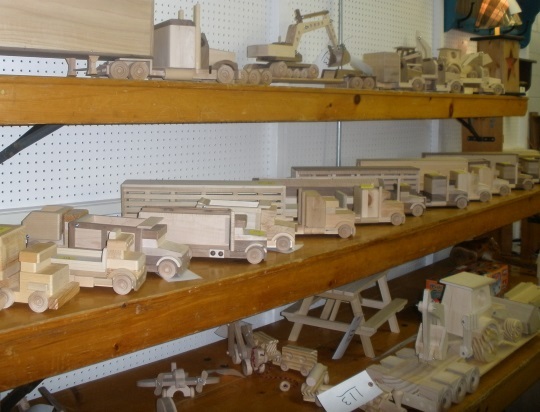 They carry things the Amish community depends on and hundreds of items anyone would use in their home, garden, or work-shop. You can spend a half day there easily! They have a lunch counter there, too. – Heinis Cheese near Bunker Hill (on CR 77) HUGE selection and they offer samples. Kauffman’s Bakery across the road is really good, too. – Along the back roads are so many small family-owned businesses. At the Heritage Center they can mark your free map and send you to cottage businesses that suit your interest. In Berlin there is a LOT of shopping, but be warned it’s not very “Amish.” I hear people say they are disappointed in how commercial it has become. Keep in mind that if it has Amish in the advertising, it’s very likely not Amish owned. If you want real experiences and accurate information, be wary about the packaged “tours” offered by non-Amish companies. You might get very inaccurate and misleading information. 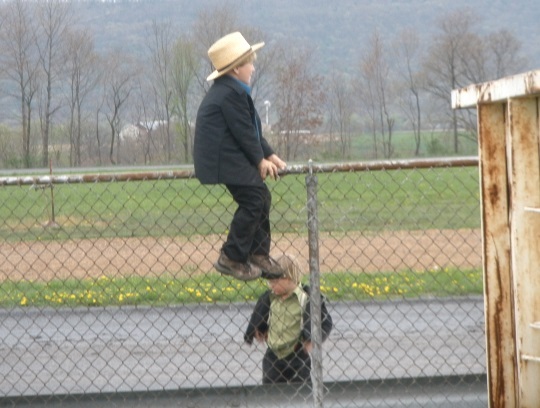 Talking to Amish or Mennonite people is the way to go. Hotels: Book as early as possible. Carlisle Inn in Walnut Creek best “really nice” hotel, Berlin Resorts or Berlin Comfort Suites are maybe more mid-range, Zinck’s Inn very nice motels. Thanks Mark. That is very helpful. My 82 year young aunt is coming with me so a lot of the trip will be determined by what she can do. But we certainly have several options from which to choose!! I love the Candy Store photo. I go to a spring fair type event (okay, its not a fair) and they have a series of tents where people sell candy and other treats, its the first place I ever had real kettle corn. Candy is a universal thing, I wonder what kind of candy is most popular in different Amish settlements. At most events the children choose elaborate candies that you don’t see elsewhere. Tall colorful sugar shapes on sticks and the taller the better. Bags of Skittles are popular. Something called “clear toy” and those Lancaster County favorites of carmel swirls with powdered sugar cream mixed in. Any specifics on time and dates, really great pictures too! thanks for sharing this! Queen/King size appliqued quilts like that would sell for at least $800-$1000 here where I live. It’s a shame it didn’t bring more. 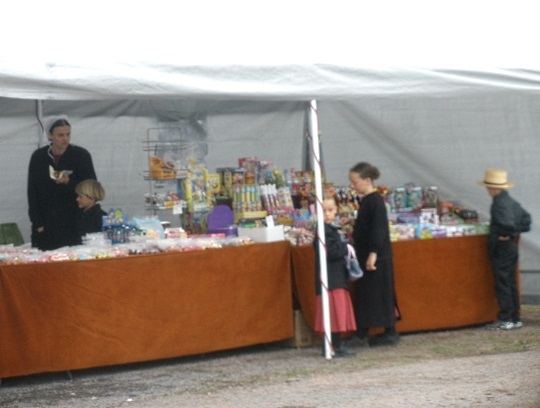 We attend the Amish school auction at Cannelburg, IN every Labor Day weekend. 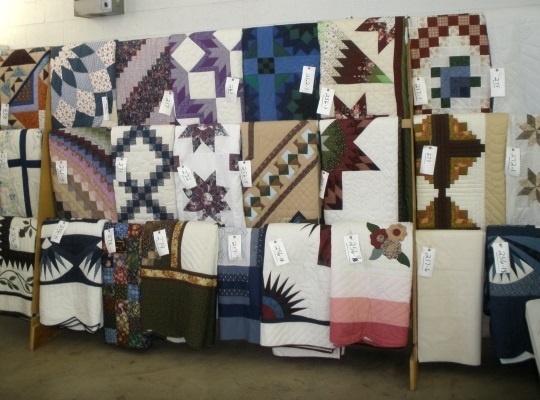 Most of the 175-200 quilts sell for at least $600 or more. Karen, I’ve attended five auctions this spring and every one has seen lower than normal retails for quilts. The highest I’ve seen this year is $450. This is not normal. I do know that quilts sell better in th fall than the spring. Perhaps the market here in South Central Pa has reached saturation. Maybe walmart is back selling those imported quilts for $39.99 again. Let us not forget that tomorrow is Ascension Day. Most all Amish and OO Mennonite will observe this as a relegious holiday. All business, stores, schools will be closed. No field work will be completed. Time will be spent either at gatherings or at home with friends and family. Best wishes. OMG. I misspelled “religious. So sorry. The 2016 Sale dates are May 6th and 7th. 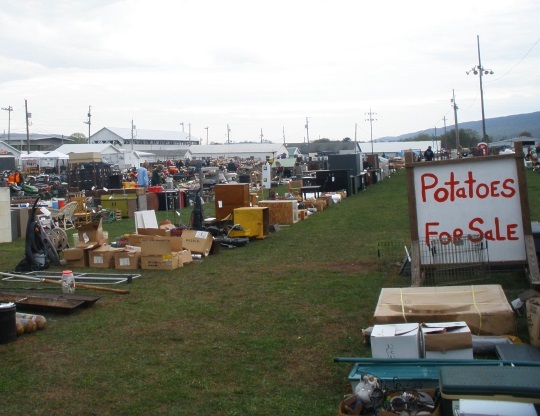 This sale has the best food of all the PA Mud Sales! Aside from the standard chicken BBQ, burgers and fries, they serve baby back ribs, a salad bar, chicken wings, (Friday only) hot sausage, grilled chicken sandwiches and salads, and more. thanks for 2016 dates of Sale!